Ring in 2016 with amazing live entertainment in a spectacular setting at the annual Niagara Falls New Year’s Eve concert in Queen Victoria Park! Located just steps away from the magnificent Niagara Falls, this concert is a one-of-kind event that’s sure to make your New Year’s Eve unforgettable. This year’s musical lineup includes Tom Cochrane & Red Rider, Dennis Deyoung and the music of Styx, Down With Webster, and Alan Doyle & The Beautiful Gypsies! 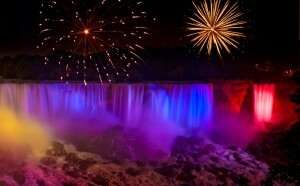 The free concert starts at 8:00pm and will also feature a live countdown and amazing fireworks over Niagara Falls. And to make sure you’re staying close to the excitement and in the heart of the city’s tourist district you can book a stay at the family-favourite Skyline Hotel & Waterpark. There is so much to see and do in Niagara Falls on New Year’s Eve, so plan your getaway now and become a part of the exciting celebration!